Grilled Venetian-Style pizza from Mancini’s Al Fresco. I just don’t think you can screw up a grilled pizza. That sounds delicious. Indi Frites from Hot Indian at the Midtown Global Market stall in the International Bazaar. These (and the rest of Hot Indian’s offerings) will only be available August 27-September 1. These are going to be winners. I’ve had them off their food truck, and they are delightful. Don’t think about it, just go get some. Cannoli from Mancini’s Al Fresco. Because cannoli. And I was really impressed with Mancini’s offerings last year. Cowboy Dave’s Cluck & Moo from The Blue Barn. This combo of smashed potatoes, roasted beef, and grilled chicken topped with gravy, crispy onions, and mustard BBQ looks like a solid choice if you want a sit down dinner. Butter Chicken Samosas from Hot Indian at the Midtown Global Market stall in the International Bazaar. These (and the rest of Hot Indian’s offerings) will only be available August 27-September 1. My money is on everything Hot Indian. These guys know what’s up. I’m betting these, and the Indi Frites (which are already staples on their food truck) are going to be huge sellers. Cowboy Bites from Frontier Bar are sweet corn kernels, bacon, jalapeños, and cheese all mixed up and deep fried. I can’t say why, they don’t look super appetizing in the photo, but I just feel like these could be winners. Buffalo’d Bones from Famous Dave’s. Probably going to be good if you like ribs and buffalo sauce. A pretty safe bet. Italian Dessert Nachos from the Pizza Shoppe. Cinnamon sugar cannoli chips with ricotta filling, strawberries, chocolate chips, nuts, and candy. I’m on board. Minnesota BEE-NICE Gluten-Free Muffing from Minnesota Farmers Union could be a winner. Not because I’m eager to eat a blueberry muffin at the fair, I think there are more unique ways to spend my eating time, but I love that it’s made with pollinator-friendly blueberries. We have to show the bees some love, people. Salad Named Soo from The Rabbit Hole at Taste of Midtown Global Market in the International Bazaar. This (and the rest of Rabbit Hole’s offerings) will only be available September 2-7. Because fresh fruits and veggies are sometimes very necessary at the fair. You need something to cut the salt of those cheese curds you just ate, and this salad looks delicious. Sara’s Tipsy Pies is a new vendor this year! I’ve sampled her wares at farmer’s markets, and they are fantastic. Also, pies + booze. Don’t ask, just eat. They’ll come in 5 flavors, bring a crew and try them all: State Fair Rhubarb Blue Hunny Do, 2 Gingers Irish Apple, Bapple (blueberry apple made with mead) Maple Bacon Apple Breakfast (only available 8-10:30am), and Salted Caramel Apple. Seafood Slider from Minnesota Wine Country. I’m usually wary of seafood at the fair that doesn’t come from Giggle’s Campfire Grill, but I’d be up for trying anything featuring wine aioli. Shanghaied Henri’s International Tacos. I would eat any of these tacos; they’ve got Korean Bar-B-Q Beef, an Oslo Taco, St. Paul Taco, and Yucatan Taco. All unique, all sound tasty. Sriracha Balls from Alton’s BBQ and Wings. If I give in, and do the Sriracha trend happening this year, it will be these. Stuffed with either chicken, corn, tomatoes, egg, Srirarcha, or Sriracha cream cheese, corn, tomatoes, and egg, and then deep fried, they sound promising. Tikka-on-a-Stikka from Hot Indian at the Midtown Global Market stall in the International Bazaar. These (and the rest of Hot Indian’s offerings) will only be available August 27-September 1. Everything from Hot Indian is going to be delicious. They are a safe bet if you love Indian flavors. Walleye Stuffed Mushrooms from Giggles’ Campfire Grill. I just love everything Giggles does. They do magic with seafood at an event where you maybe should rethink ordering seafood. Wine Fried Kalettes from Minnesota Wine Country. Kale + Wine + sweet chili sauce = excellent idea. 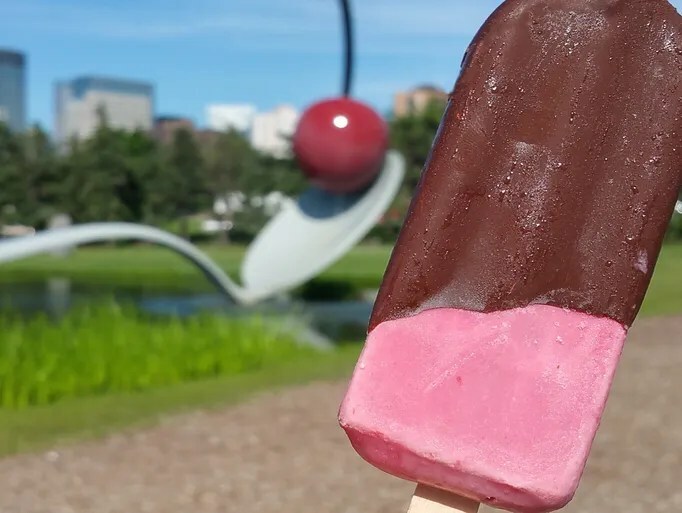 Chocolate Dipped Cherry on a Spoon from Johnny Pops. I love Johnny Pops. Thank you for not making your ice cream spicy, Sriracha-ed, or pickle flavored. 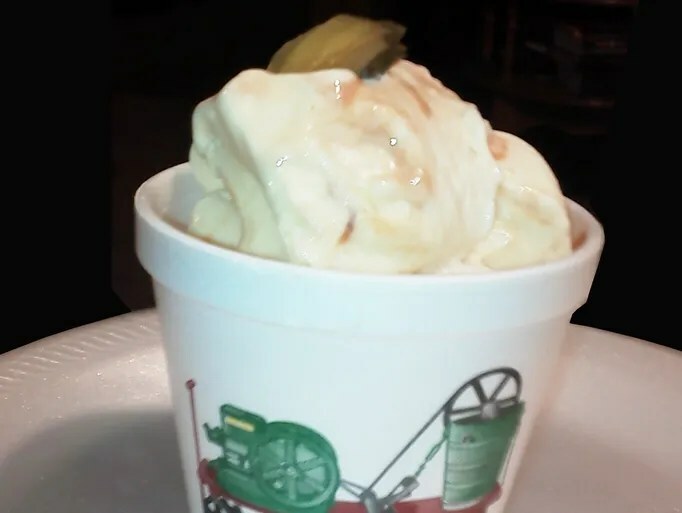 BBQ Pickle Ice Cream from R&R Ice Cream. I purposefully put this at the top of my bad list. This will not ever taste good. Why would anyone even do something like this to ice cream. What did ice cream ever do to you??? Burger dogs from Gass Station Grill. This is a blend of hamburger, hot dog, bacon, cheese, and a “splash” of jalapeño on a hot dog bun. This is a mash up of already questionable meat products from a place called “Gass Station Grill”. I just don’t have high hopes. Hot Tail from The Rabbit Hole, located at the Taste of Midtown Global Market at the International Bazaar. This is only available September 2-7. It’s actually a roasted pig tail coated in a ginger scallion sauce. I was super excited to see The Rabbit Hold showing up at the State Fair, but I just can’t eat tail. Points for a funny name though. Limerick Stix from O’Gara’s at the Fair is a blend of pimento cheese and cayanne pepper coated in corn meal and deep fried. It’s another fried cheese stick. Unless the cheese is high quality, I won’t be filling precious stomach space with these. 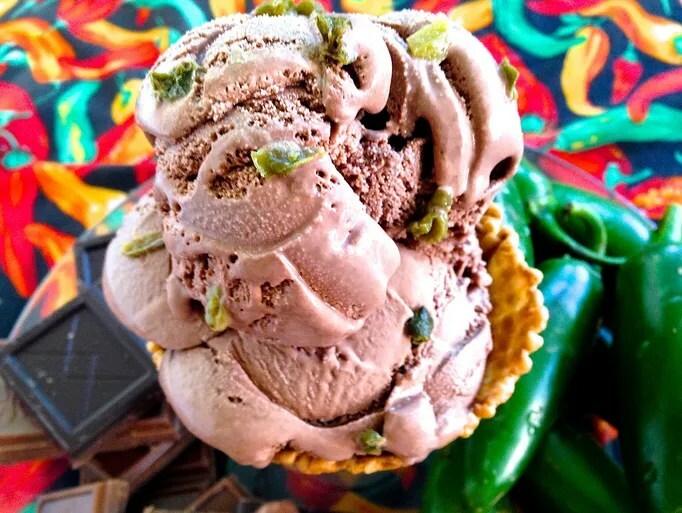 Chocolate Jalapeño Ice Cream from Rainbow Ice Cream. I don’t like spicy ice cream. It’s not cute. I want sweets, fats, sugars. Not spice. Also, think of all the sad children who just want some chocolate ice cream and suddenly their mouths are on fire. Not cool. Maple bacon funnel cake from Funnel Cakes. This one is a dud for me because I am not a huge bacon bits fan, and I’m not a huge funnel cake fan. If you love both, this could be for you. Pretzel Croissant Sandwich from French Meadow Bakery. I’m sorry, I love you, French Meadow, but I just don’t think a pretzel croissant is a great idea. Pretezels are pretty much the opposite of croissants, and after the disappointing cronut you debuted a few years ago, I just don’t think this will be anything special. Fire and Ice Kreme from Goertze’s Dairy Kone. I just…what? Ice cream with Sriracha (ENOUGH ALREADY!) and crunched up corn chips. Those corn chips will get soggy. 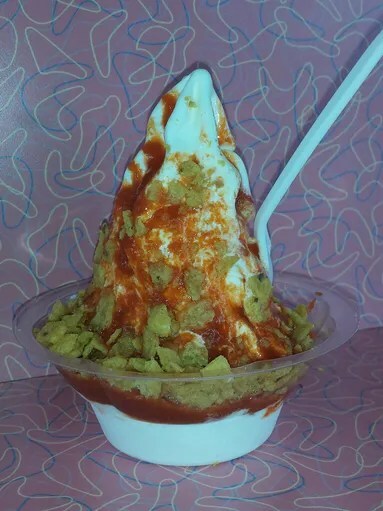 Sriracha never needs to be on ice cream. Ever. Prime Rib to Go from Coasters. I’m just not that into prime rib. If it’s juicy and tender, I could be totally wrong, and this cone sandwich could be a delight. Smokey’s Breakfast Burger from Smokey’s Char-Broiler. I don’t love burgers with additional meat as a topping. Especially not for breakfast. Spam Burgers in 5 new flavors from Spam Burgers. Enough already. Stop with the Spam. If you’re curious, the new flavors are Jalapeño, Hot & Spicy, Bacon, Hickory Smoke, and Black Pepper. Salted Caramel Puff Malts from the Dairy Goodness Bar. 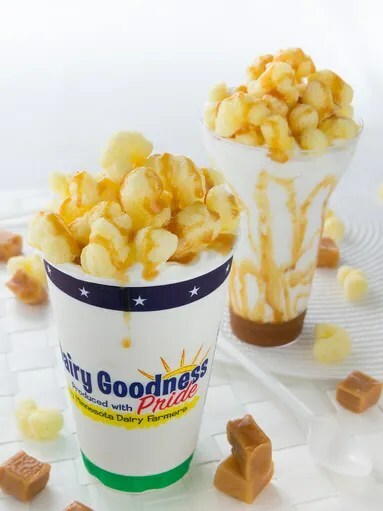 Salted caramel sounds great, but you know those puff corns are going to be all soggy later. Sriracha Dog from Snack House. Ugh. Just ugh. Stuffed Italian Meatloaf On-a-stick from Green Mill. I’m not a meatloaf fan, and I’m not a Green Mill fan, so I don’t have high hopes. Totchos from Boulevard Grill. I feel like we’ve been here before. Can totchos even be considered a “new” food? Mac & Cheese Cupcake from LuLu’s Public House. It’s the Cheez Whiz on top that is bugging me with this one. The mac & cheese looks solid, but can’t we find a better topping than Cheez Whiz? Chilled Bread Pudding from Blue Moon Dine-In Theater. I just don’t know about this. I have some issues with Blue Moon Dine-In. They always make things that sound like they would be good, but are just mediocre when you stack them up next to other offerings at the fair. Plus it’s chilled and not hot. So there’s that. Also, no ice cream. Meh. Deep fried ribs from the Ball Park Cafe. My resident rib expert says this could be good, but it could also go horribly wrong. We’re not sure what frying the ribs would do to the meat in terms of that juicy, fall-off-the-bone quality we like. Grandma Deb’s Snicker Bar Salad from The Blue Barn is a mix of vanilla pudding, Granny Smith apples, and Snickers bars topped with whipped cream and caramel sauce. I think this will be a huge hit with a certain segment of Minnesotans, but I’m not a huge fan of jello salad and things like that, so I’m not convinced I would love this particular dish. Minnesota Wild Rice Benedict Muffin from LuLu’s Public House. The hollandaise sauce on this wild rice English muffin with sliced ham and a soft-cooked egg could make or break this dish. If I find myself eating breakfast at the fair, this is probably what I’d go for. Doo Wop Dip from West End Creamery. 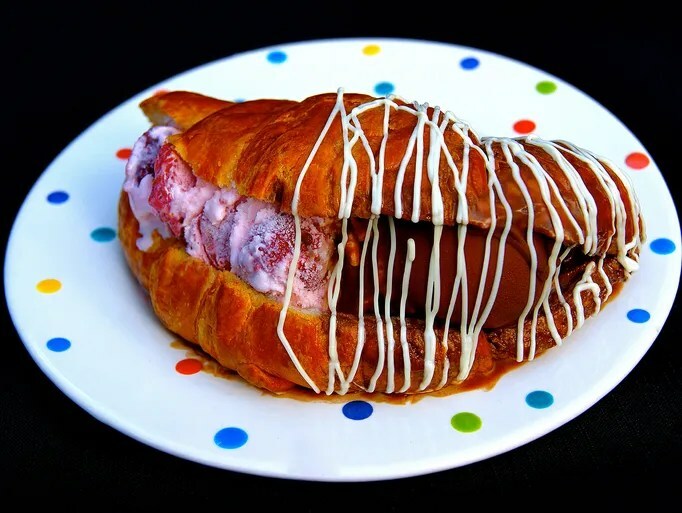 This is a croissant stuffed with strawberry ice cream, dipped in chocolate and drizzled with white chocolate. I’m sold if the croissant isn’t frozen with the ice cream. I want a soft, flakey croissant, please! Island Slaw from Island Noodles. This looks promising, but it’s all based on the quality of the slaw. If the slaw is fresh, we have a winner, and a healthy-ish option at the fair. IF it’s your standard cafeteria fare, then it could fall flat. Meatloaf Hash from The Blue Barn is meatloaf, sautéed potatoes, peppers, and onions, topped with scrambled eggs and béarnaise sauce. Personally, I am not a meatloaf fan. But I do know a few people who would go for something like this, so I’m putting it in the wild card pile. 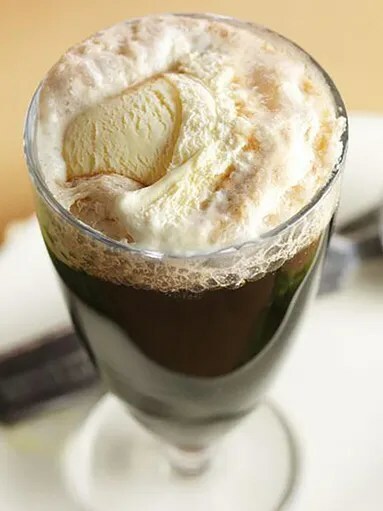 Espresso Floats from Java Jive. This will be big with coffee lovers. Steak Apizzaiola from Spaghetti Eddie’s. This steak sandwich is served with a side of marinara sauce, which could make for one tasty bite if done right. Sweet Potato Taco from Potato Man & Sweetie. I love that vegetables are the star here, but I’m not convinced about the texture of mashed sweet potatoes in my taco. Up Nort Shoreman’s Lunch from The Blue Barn. This battered norther pike with fresh tomato sauce, potatoes, and corn will probably be solid if you’re looking for an entire meal on one plate. Butter Queen Coffee Ice Cream from Hamline Church Dining Hall. 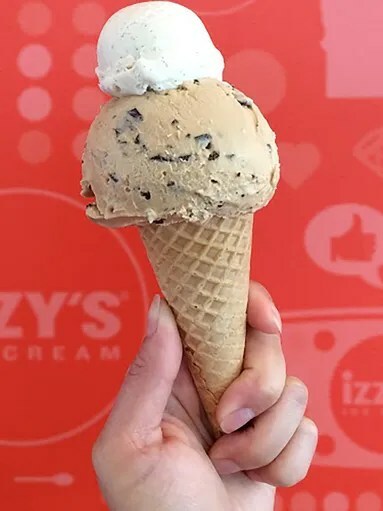 Izzy’s puts up solid flavors each year. I’m just not a coffee fan. This entry was posted in Uncategorized and tagged food reviews, Minnesota State Fair Foods 2015, New Minnesota State Fair Foods 2015, New State Fair Foods 2015, Weird Foods, Wild State Fair Foods by theculinarycapers. Bookmark the permalink.